In ancient geography, Cappadocia (Greek: Καππαδοκία; see also List of traditional Greek place names; Turkish Kapadokya) was an extensive inland district of Asia Minor (modern Turkey). In the time of Herodotus the Cappadocians occupied the whole region from Mount Taurus to the Euxine (Black Sea). Cappadocia, in this sense, was bounded in the south by the chain of Mount Taurus, to the east by the Euphrates, north by Pontus, and west vaguely by the great central salt lake. But it is impossible to define its limits with accuracy. Strabo, the only ancient author who gives any circumstantial account of the country, greatly exaggerated its dimensions; it is now believed to have been about 250 miles in length by less than 150 in breadth. 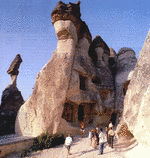 There are many "must see" places in Cappadocia, such as the various "Fairy chimneys", Göreme Valley, Göreme National Park, rock churches, the underground cities of Kaymakli, Derinkuyu (or Ozkonak), Zelve Valley, Avanos, with its pottery, the Uchisar rock fortress, the Ihlara Valley, and Soganli. Cycling, walking and horseback tours are becoming very popular in the region. 2005 official tourism figures show 850,000 foreign tourists per year, and around 1 million Turkish tourists.